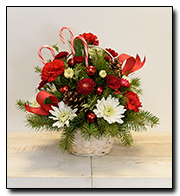 Marvelous mini red carnations are artfully on display with merry touches like shimmery ornaments, pinecones, berries, Christmas ribbon and holiday greens. 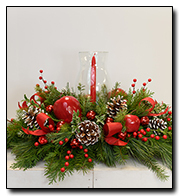 Three graceful red taper candles add the perfect magical touch. 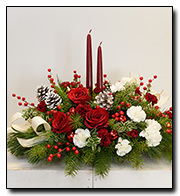 Approximately 23 W x 16 H.
Stunning red and white roses, white spray roses and chrysanthemums plus all of your holiday favorites like pinecones, berries, Christmas greenery and two tall-tapered candles. 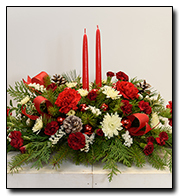 A brilliant way to send your Christmas wishes in style. 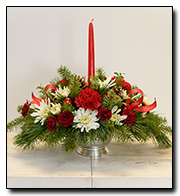 Approximately 21 W x 17 H.
With all of the makings for a holiday celebration, a festibe red vase holds the perfect mix of red carnations and berries, white chrysanthemums and winter greens including holly. 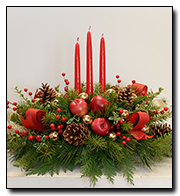 Now how's that for jolly? 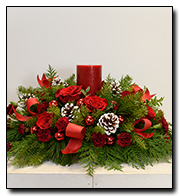 Approximately 12 W x 10 H..
Gorgeous red roses and spray roses, berry sprays and carnations are arranged with pinecones and festive greenery. 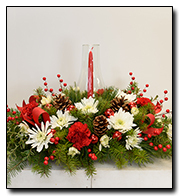 A great way to serve up holiday cheer! 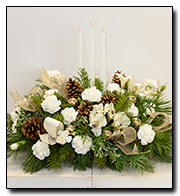 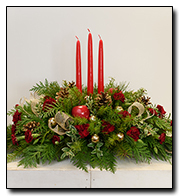 Approximately 22 W x 12 1/4 H.
Three gorgeous gold taper candles take center stage in an arrangement of white alstroemeria, gold ornaments, pinecones, gold ribbon, Christmas greenery and more. 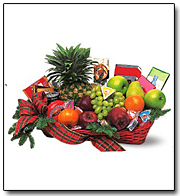 This kind of high style really is fit for a king or queen! 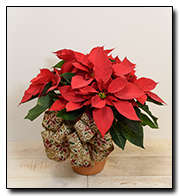 Approximately 23 W x 17 H.
A large 8" red poinsettia is delivered in a natural container that's all wrapped up with a beautiful ribbon. 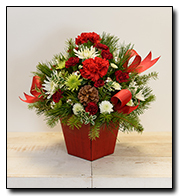 It's a beautifully traditional gift � with a sizable difference! 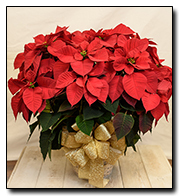 Approximately 24 W x 25 H.